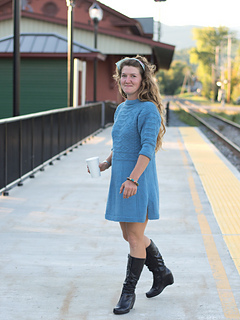 This dress is knitted in the style of the British gansey. It begins with a split garter stitch welt at the bottom hem, knitted flat. Once the welts develop into side vents, the work is joined in the round. The skirt is worked circularly with gentle decreases to the hip, then decreased a bit more to the waist. At the waist, the body is slightly increased and the patterning begins, including the underarm gussets. 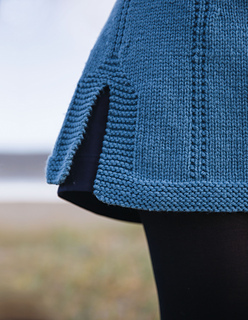 The body is split into halves at the armhole and the front and back are knitted flat. 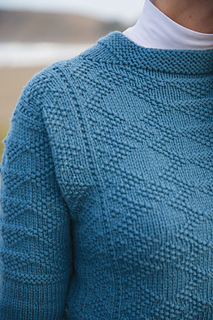 The shoulders are joined with neck gussets, and the three-quarter sleeves are picked up and knitted to the cuff while decreasing the underarm gusset away. The neck band is then picked up and knitted in garter stitch.